Offset paying homage to his baby mama Cardi B. From their first public outing at the 2017 Super Bowl to the scandals, secret wedding, and social media shout-outs that followed, Cardi B and Offset have remained in the headlines as one of hip-hop's most high-profile power couples. Weathering everything from infidelity to the added stress of their very vocal fanbases commenting on their relationship, #CoffSet (it's a thing apparently) is seemingly impervious to the many pitfalls of falling in love in the public eye. Now settling down, and fully enjoying the company of their newborn daughter Kulture Kiari Cephus born earlier this summer, Cardi B and Offset have no shame in showing the world just how happy they are when the cameras stop flashing. Opening up about his personal life during a recent interview with the New York Times, Offset dished on why his Bronx-bred better half is responsible for his newfound contentment with family life. 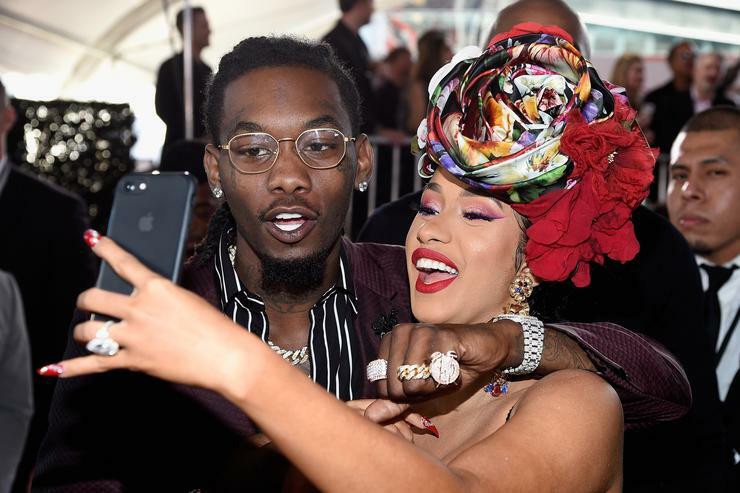 Eager to flex his wifey's impressive come-up (and subsequent baby snap-back) for the 'Gram, check out all times Offset couldn't help but send big ups to his Cardi B on social media. Clearly, Offset has no problem showing off (nearly) every curve of Bardi's tatted, smokin' body to his 9.6 million followers. To mark the date of baby Kulture's birth, Offset shared a snap from Cardi's maternity shoot while shouting out each member of their growing family. "My wife a boss like me," captioned Offset alongside a photo of the two of them together. To celebrate his wife's Fashion Nova fashion line, Offset took to Instagram. "You keep doing the impossible you will continue to go far and I will support you the same way. I love you," wrote Offset in a promotional post dedicated to his better half. Always a strong supporter of Cardi's talent behind the mic, Offset took to social media to promote his wife's debut studio album Invasion of Privacy by name-dropping the project and sharing a stunning shot of the rapper. Naturally, Bardi couldn't grace the cover of Rolling Stone without Offset dropping a "legendary" Instagram shoutout. Offset couldn't let Cardi B's birthday pass without a dedicated post to his lady and some PDA/second base action. Cardi's stripper background is far from a sore point for Offset. Instead, the Migos rapper praises her grind and unrelenting work ethic in a post aimed at reminding her that her past proves that she's "not weak." "Beautiful shoot. Can't wait 'til my daughter get here," wrote Offset alongside a picture of their iconic 2018 Rolling Stone "Hip-Hop Love Story" cover. Unlike some men, Offset isn't turned off my Cardi's meteoric rise to the top. Instead, he publicly implores her to "keep winning."